The culvert at the junction of the private Brush Road and California State Highway 17 failed during the winter of 2005. The culvert consists of a vertical structure rising from a concrete box (see picture at the top right of this web page) which collects water that has drained down the mountain and then directs the water out of the side of the concrete box into a horizontal, 100 foot long pipe which runs underneath Brush Road and drains the the water on the downhill side, towards the state highway (see picture). 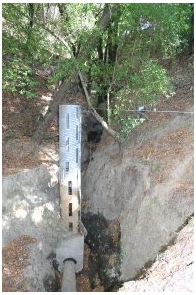 The concrete box holding the vertical part of the culvert is located on private land that is enclosed in the small yellow box on the Culvert Aerial Views page of this web site. The large yellow box shows the property borders of the parcel in which the culvert is located. The failure occurred where the horizontal pipe used to emerge from the side of the concrete box. As can be seen in the picture, the pipe no longer connects to the box, and instead has started to slide underneath the road. As a result, in a rainstorm, water pools up & flows through and around the horizontal pipe and is eroding underneath Brush Road, and eventually will lead to the collapse of the road. The State of California has been maintaining this culvert since 1939, without an easement to do so. The various landowners of the parcel (including the current) have allowed this maintenance to occur, they have apparently refrained from performing any maintenance themselves, while remaining liable for any damage the faliure to maintain may cause to the road, or that the resulting hole may present to unsuspecting motorists driving on Brush Road. After consultation with legal representation of the State of California, council to the Brush Road corporation, council for the current land owner, and a search of the County of Santa Clara property records, the parties have entered into the Agreement and Release below which governs this land going forward, and to allow repairs on the culvert to proceed. 02/11/1941 Steinbeck - Foster easement (1941) (retyped). John Ernst Steinbeck apparently paid to realign the road in the late 1930s as Highway 17 was being created. Later he executed this agreement with Foster, across whose lands the road runs, making it clear that Steinbeck and his assignees have an ingress and egress right, including the right to repair. 5:04 pm, 10/17/1989 Magnitude 7.0 earthquake strikes at Loma Preita, 9 miles south of the Culvert, on the San Andreas Fault, which runs along State Highway 17, The fault is located 700 feet from the culvert. State Highway 17 is closed for one month due to a landslide. Most homes on Brush Road suffer minor to major damage; Two homes are destroyed. All wells are severed by the earth movement. The road suffers serious surface damage, and many of the existing culverts are compromised. 10/21/1991 Brush Road hires DSS Construction to repave the road, and remove and replace all of the existing culverts. The plan of work shows all of the culverts which Brush Road has today existed in 1991, had been damaged in the 1989 earthquake, and were replaced in 1991. This clearly shows these culverts have been in place for more than 25 years. Sal alledges that the culverts designated C3 and C4 on the last page are new development created in 2004; in truth, these culverts have been in place for decades. 12/06/1993 Brush & Old Well Mutual Water Company is established to bring San Jose Water city water to the road, (replacing the many wells which were destroyed by the earthquake) and the BOWMWC builds a water main down the road. Their AsBuilt blueprints document these same culverts C3 and C4, which are circled in the as built diagram in the link; at this time Danais owned what is today owned by Sal. The original AsBuilt is also available. 03/01/2005 Letter from the State to Brush Road first informing us of the failure of the Culvert. 05/01/2005 Caltrans draws up a plan that suggests inserting a platic pipe inside the failed 25 inch horizontal pipe, and reattaching this to the vertical upright. This plan would need no permits, as it would restore the original structure. Brush engages a contractor to send a camera down the horizontal pipe to access its integrity. We quickly discover that the pipe is rotted out almost immediately, and partially collapsed, such that the water runs straight out the bottom and has carved a big cave under the pipe. As such we have no confidence that we will be able to insert a large diameter pipe inside the 25 inch pipe. 08/25/2005 Brush Road Annual meeting minutes. Discusses the Culvert, and accepts report from a member (Michael Hunt) who has been investigating the situation. Brush elects a new Board of Directors. Plan of action is laid out to raise money, learn our options and get a fix done as soon as possible. 08/31/2005 Brush Road hires Mark Strombotne to advise the Board on dealing with the State on the Culvert matter. 09/16/2005 Brush sends letter to State demanding that they fix the Culvert structure which (we thought at the time) they had built on the land of one of our members. 10/07/2005 Brush sends letter to State offering the Brush Road Corporation would contribute $15,000 towards the repair, if the State performed the repair promptly, and recorded an agreement affirming their further obligation to repair and maintain the structure, as they had been doing for 70 years. 10/17/2005 California Asphalt & Paving completes its work repaving and redoing the culvert intakes. 10/20/2005 State counters with an offer to contribute $20,000 to Brush if it will perform the repair, and recorded an agreement having Brush take the future obligation to repair and maintain the structure. 10/20/2005 Brush counters with a offer to pay for the complete fix if the State continues to maintain the structure. 11/01/2005 State responds, saying it has no interest or ability to maintain a structure which is not on their land. 1/16/2006 - 4/16/2006 Contractors and engineers refuse to bid on the job, or even postulate a possible fix, as conditions at the site are too dangerouus even to approach the edge of the ravine. Brush Road installs reflective Caution tape on sawhorses to warn away drivers from the hazard. 10/3/2006 Brush Road hires Roy Nelson to perform an Engineering Study of the complete flow that could be generated by the mountain, and draw up the consensus design of a structure that can handle this flow. 12/18/2006 Minutes of the Winter 2006 Members meeting - State verbally agreed to pay for some repair work, but Brush must get engineering plans drawn up, and obtain bids from two contractors for the approval of the State. The State suggests some of its favored contractors; we contact them and none of them are interested in a job this small. We have obtained engineering plans, and are seeking bids. Members authorize Brush to continue down this path; and also to urge all of our guests to take notice of the hazard posed by the culvert. 1/18/2007 We get one bid, from Messa, for $102k. We need a second bid. 2/14/2007 We get a second bid, from UpGrade Construction, for $123,480k. 02/20/2007 Brush meets with its engineer to discuss the bids. Consensus is that because we have not done a full engineering study (cost estimate is about $15k to do this), the contractors do not know how much fill will be needed, so are inflating their estimates to cover themselves. We decided to present the bids we have to CalTrans and have an open dicussion on what to do, how much of the cost will they pay, what do they suggest we do. 07/10/2007 Letter from Brush to the State with the bids we have been able to obtain, and seeking their approval and funding. 7/11/2007 K. Kim tells us she has moved on to other responsibilies, and passes us on to someone else. We also contact our State Senator (Able Maldanado), asking him to help call attention to this matter. 8/20/2007 CalTrans assigns Frank Valentini as the new attorney, and we bring him up to speed on the matter. 08/27/2007 Letter from the State outlining that while they have maintained the culvert for 70 years, they will cease doing this, and checking to see if the offer of $20,000 to help us get the culvert fixed is still valid. 09/2/2007 Brush Board brings Sal Giovando up to speed on the matter, and asking for his help. At this time we all still believe that the State built this structure on land that was later purchased by Sal; and that the State was obligated to continue to maintain the structure. 09/5/2007 Brush calls Sal to discuss the letter. Sal says he does not care about this culvert, and for Brush to do what ever we think is right to fix it ourselves. Sal states that he does not know any engineers or politicians, that he is a real estate landlord (http://www.vrent.com) , and he can not spend any time helping us. 09/09/2007 CalTrans tells us they will not renew their offer to pay $20k to help fix the culvert. They take the position it is not their problem. 09/10/2007 - 09/24/2007 Brush road does extensive research to understand options. Again, Highway 17 was built in 1937, during great depression, and there was a spirit of "build it now, get the rights later" at that time. We compared the style of construction of the culvert with similar culverts on Caltrans land, and found them to be identical. We learned that Caltrans did acquire the land under part of Brush Road in 1940, but not the land under this culvert. We obtained Title Reports. We searched easement agreements. We documented our observations of Caltrans maintaining the culvert over the past 50 years. We prepared a litigation plan for if we needed to sue Caltrans to compell them to fix their culvert. 09/24/2007 Brush communicates to Caltrans that we feel that "They built it, they broke it, and they must fix it". At minimum, even if they can show that they did not build it, they have already admitted that they have been exclusively maintaining it for the past 70 years, and so it is clear that it was them that broke it, so they must fix it. We make it clear that we feel the liability for a catastrophic failure is theirs, and so if such a failure blocks Highway 17, it is their fault. 10/10/2007 Caltrans digs out the lower culvert, which is on their land, and which accepts the water from the failed culvert, and builds a large berm to protect Highway 17 if that lower culvert should fail. 10/18/2007 - 11/05/2007 Brush meets with the chief of staff for Abel Maldanado, our State Senator, at the site. We show her the various communications, and she agrees to present this to the senator. The senator works to get Caltrans to take another look at the matter, and to put Kimberley Kim back on the issue. Brush files a claim to recover its engineering costs incured following the original agreement where the State would fund a repair if Brush Road developed a repair plan, as a statue of limitations looms. 12/7/2007 Caltrans agrees to have its engineers and department staff meet with the Brush Road board, with out lawyers present, to see if a workable solution can be achieved outside of the court system. (Seems like an excellent idea! - Editor). 12/14/2007 Caltrans and Brush meet in their Oakland headquarters, discuss the issues as we each understand them, explore various options, and agree to continue to work together. 1/2008 - 2/2008 Caltrans and Brush have a series of meetings, their staff inspects the site jointly with us. 03/31/2008 Caltrans discovers the 1941 Foster - Steinbeck agreement, and forwards a copy to Brush Road. Basically, this clearly shows the culvert was built by Steinbeck, not by the State, and further has Steinbeck retaining the rights to use & repair the entire road and all of its culverts. 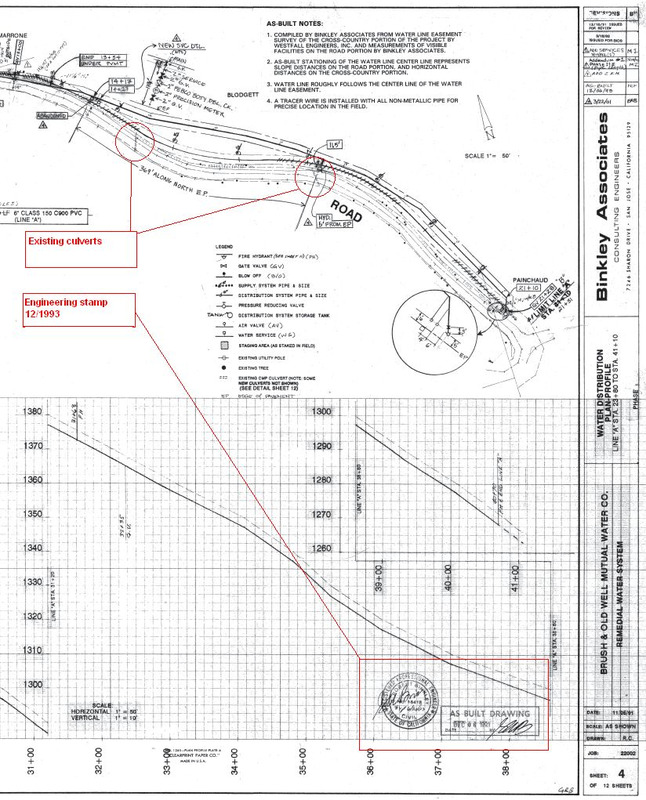 1/2008 - 4/2008 Caltrans and Brush have further face to face discussions and phone negotiations, and finally agree in principle that Caltrans will pay $42,000 to Brush if we fix the culvert, and take recorded ongoing responsibility for this section of road. State drafts up an agreement between Brush Road, Sal (as the owner of the land even though he is also a member of Brush Road), and the owner of three additional parcels on Ridge Road, which is not a part of the Brush Road corporation, but rely who rely on this road for access to their homes. 06/20/2008 Brush Road informs Sal that the Brush Road Corporation has reached agreement where the State will pay $42,000 to help repair the road, in exchange for the signing of an Agreement and Release document. All of the Brush Road members and the Ridge Road owners have signed this, and we just need Sal's signature to get the money from the State. In a face to face meeting at the site, Sal outlines 4 conditions he requires for Brush Road to perform in order for him to sign the agreement and allow the repair to take place. 08/07/2008 Letter from Sal's Attorney, Matthew Hurley, who states that Sal has engaged him to handle the matter for Sal going forward, and asking for background information. 08/08/2008 Letter from Brush to Matt Hurley, thanking him for his involvement, and supplying him preliminary background information. 08/14/2008 Letter from Matt to Brush, thanking for all of the data and the pictures. Matt states he has been on the site numerous times, and certainly has noticed the drainage structure. He again asks if there has been a survey to determine if the structure is on his client's land, as well as a number of additional questions about other drainage culverts. 08/21/2008 Letter from Brush to Matt, citing his client's title report, which show the Steinbeck - Foster agreement as item 5 and the bylaws of the Brush Road Associated as item 10. Brush further states it has not wish to litiget; it simply wishes to do its part to insure its members (including Sal's tenants) continue to have ingress and egress capability to their lands. 08/22/2008 Letter from Brush to Sal, asking him to bring some business sense to the matter. claims that other people broke the culvert, and they should fix it. reminds Sal that no one is asking him to contribute any mony towards a fix; that the State of California and Brush Road coporation have been offering since July, 2008 to perform the fix using their own money at no cost to him. Easements will be negotiated later passing responsibility for future repairs and maintenance to Brush from Sal. 08/29/2008 Letter from Matt to Brush expressing surprise that the Brush Road corporation would not be willing to do some temporary patch work outside its easement, and accusing us of bullying his client. The matter of the uphill drainage culvert is cited as a brand new non negotiable condition imposed by Sal. Contractors tell us the cheapest fix is the permanent fix, and there is still time to do this. We have enough money to do the permanent fix, but not to do a temporary fix and then a later permanent fix. The State has offered $42,000 to Brush Road if it takes over permanent management responsibility for the culvert, but this requires an easement for Brush Road to become that party. 09/30/2008 Brush Road's attorney contacts Sal's attorney via phone, and in the discussion suggests mediation as a way to resolve the matter. Matt agrees to contact his client to get his views on the suggestion. 12/29/2008 Sal's attorney states his client has no intention of working with us, he refuses mediation, he does not like the proposed fix, and he states that he believes we installed some new culvert higher up on Brush Road which caused the failure. (Editor's note - we have since reailzed that this culvert repair work was done 8 months AFTER the large culvert failed). We again ask that if Sal feels our proposed fixes are inadequate, that he present alternative plans. We restate that there was no new culvert installed; instead as a part of our regular maintenance, we repaired the catch basin around a culvert higher up Brush Road; and thay this neither increased nor decreased the flow of water. 02/20/2009 Brush and the State complete the negotiation on the language of the revised agreement; Brush calls for a Membership meeting to approve the revised agreement. Sal notifies us that his attorney plans to attend the meeting. We remind him that it is a member only meeting, but that we are happy to have our Board and its attorney meet with Sal and his attorney before the Membership meeting. 02/27/2009 Brush meets with Sal (and attorneys) on site. Sal demands that all culverts that drain any water onto his land from the road be removed, before he will allow any repair of the failed culverts. We remind him that these culverts have been on his land for at least thirty years; and he has only owned the land for 5 years. The culverts were there when he bought the land. We also point out that all of the water draining from the road to his land, first drained from his land onto the road. We state that we will remove the culverts if he builds a curb that keeps all of the water originating from his land on his land (at which point it will enter the same ravine). 3/4/2009 Minutes of the Spring 2009 Members meeting. All attending the meeting vote in favor of Brush signing the agreement, and accepting the State's money. 03/17/2009 Letter where we summerize our discussion of 2/27, and correct some misunderstandings - Brush never committed to implement a storm sewer project; instead we committed to get a bid for such a project, and then discuss options for funding the improvement to Sal's property. 03/30/2009 We obtain a bid for $120,000k for installing the storm sewer. (this includes the estimation of the required permits and engineering studies for such new construction, which are estimated to be about $60k). We get an alternative proposal to simply lay flexible plastic pipe done the ravine to hold the water collected by the culverts, and bury and hence anchor this pipe with drain rock. The drain rock will further serve to improve the stability of the ravine. The bid for this is $15,000. 05/15/2009 Minutes of the Membership meeting. Sal attends this meeting in person. We inform everyone that the check from the State has been received, and that construction season has now opened up again. Sal states his position that he requires us to alter the culverts further up on his land before he will allow us to repair the lower culvert. Sal claims he has not seen our proposals so we agree to meet him again and present them. 07/09/2009 Brush meets with Sal at one of his resturants in Palo Alto, and we discuss the culvert. We remind him of our proposed fixes, and state that we believe the members would likely vote to have Brush Road pay for the second fix (laying platic pipe in the ravine and covering it with drainrock) as a gesture to address his concerns, as the cost would be about $500 per parcel. However, we feel that (in this economy, or any economy) our members would not be in favor of paying about $10,000 each to install a storm sewer in the road; as this is more than a gesture. 08/08/2009 Brush meets with Sal at the site and discusses the possible ways forward. The construction season is rapidly closing, and we risk the danger of another winter rains causing the feared complete collapse of the road. Sal reviews the state of the lower culvert, and his face shows that he sees that the risk has increased over the years. He states that he does not want the platic pipe in the ravine; and instead he agrees that if Brush will install a curb to block of one culverts temporaily (the one at the top of the ravine), and further install curbing along the lower section of Brush Road to keep the water that would otherwise drain into that culvert on the road, so it would drain all the way down the road (hopefully not creating a hazard) and into the large culverts basin, that he will remove his objection to our repairing the lower culvert. We agree to this in priciple, and offer to mark the location of the various curbing and have Sal come back and review this before we start work. We make the marks, but Sal is very busy and can not visit the site. 08/12/2009 Brush signs the contract with our contractor to begin work, with a start date of 8/17/2009, in anticipation that Sal will indeed find time to visit the site and approve their locations as we discussed. 08/13/2009 Brush sends notice to its members that work will begin on 8/17/2009, it will take about 3 weeks; the road will never be closed, and that all should drive carefully. The final Agreement and Release as signed by the State, Ridge Road Owners and Brush Road Corporation (pdf). Bid to repair the Culvert from Pete Messa & Sons, Inc.
Engineering study of the existing Drainage in the culvert watershed by Roy A. Nelson, CE. Note that because this proposal is a repair of existing drainage, which does not change any drainage pattern, or have any negative effect on the flow of water or alter its quality, the County has signed off that no permits are required. $35k to repave the entire lower section of the road with 3 inches of asphalt. One would need to contract for the $41k plus one of the repaving options. We have been advised that because this proposal would alter the drainage pattern of storm water runoff from its existing path, approvals would be required a from number of State and County offices (including but not limited to US Fish and Game, The Department of Natural Resources, Santa Clara Water District, Santa Clara Building Department, as well as from the down hill property owner (The State of California)). Nearly all of these agencies would require a complete engineering study of the effects of this diversion, which would provide insurance against any issues that arise from such construction. We received a bid for such a study from Roy A Nelson, CE in the amount of $60k. In addition various permit fees and expert testimony fees would also be required. As a result the minimum amount required to fund this proposal is about $120k. The State of California has offered to contribute half of the cost to fix the culvert, with the condition that the Brush Road Corporation take on the responsibilty & liability for maintaining the culvert for the rest of time. The Brush Road Corporation has agreed to accept the maintainence obligation, and further to fund the balance of the construction cost. The Brush Road Corporation needs a recorded easement from the landowner (Los Gatos Real, LLC) to permit the corporation to repair the culvert and maintain it for the rest of time, the borders of this easement roughly consisting of the small yellow box in the picture. The landowner has not yet granted an easement; so far the progress has been limited to the series of email querys detailed below on the time line. Below are a series of letters containing the back and forth conversation as we try to convince the landowner and his attorney to grant to the Road Corporation this easement. We remain hopeful that the landowner sees reason before the road collapses and/or one of our friends or neighbors is killed crashing into his canyon. Matthew Hurley ("Matt"), the legal representative for Los Gatos Real, LLC. Los Gatos Real, LLC owns the property where the culvert is located. Michael McNamara ("Mac") the president of the Brush Road Corporation. The question I have asked from the beginning continues to go unanswered. Was there a field survey conducted by the State or the corporation which resulted in the property corners being identified and marked for identification in a manner that is readily visible at the site? Your topo map rendition is a good paper presentation....but it presumes facts (i.e. where the property lines are plotted) which I have yet to be able to verify. I also note in your pictures that there appear to be several corrugated plastic pipes exposed in and around the washout area. Do you know the source and origin of these pipes? These appear to be of materials much newer than the structure....was any other drainage work done in this area? In fact, could you advise me of all drainage related work that the corporation has initiated, knows of or has participated in along the Brush Road right of way over the past, say, ten to fifteen years........? I would like to take a site visit in the near future, but would appreciate verification of the above prior to doing so.